So, we bought a sectional for our family room. It arrived last Thursday only about 12 hours before we left for Pittsburgh. It was love at first sight. So, why did I replace a 2 year old couch which had nothing wrong with it? 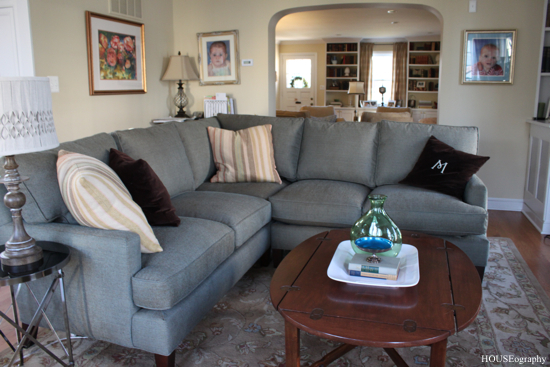 The truth is that it never felt like the right sofa for our family room. It was small - like a love seat - so there was never enough room. Even my two little kids would fight about who had more space on the couch. It drove me nuts. That sofa is going to have a good home in our play room. 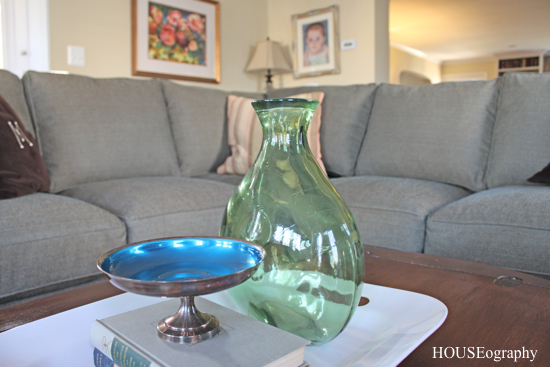 Handy Hubby is investigating 12-step programs for furniture buying addictions. Back to the family room. Here's our sofa-less family room waiting patiently for its new leader. Handy Hubby would not let me include a picture of him vacuuming the rug! I started looking for a new sofa in the early fall. I realized that what I wanted more than anything was a sectional that our little family of four could snuggle up on to watch movies on a Friday night. Once again, I took a huge leap of faith and bought it without sitting on it. 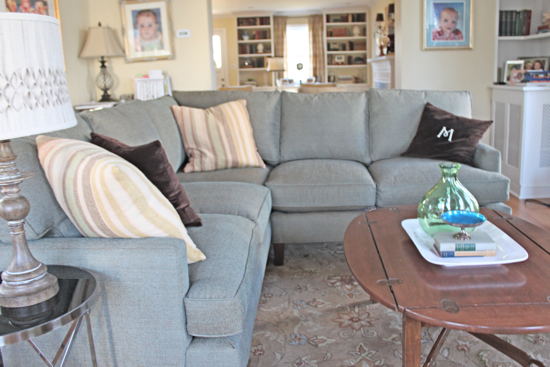 I looked at a lot of different brands but finding a sofa that was small enough for our family room was the most challenging part. I couldn't find anything locally, so I went for it. 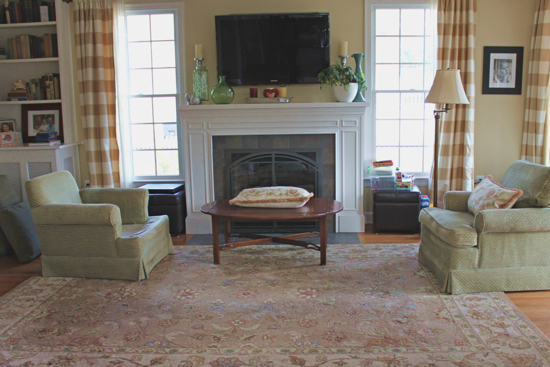 Like the green chairs in the family room, it was made by Lee Industries that also made the green chairs in the family room. This is a high-quality brand made in North Carolina. I love the fabric which is a blue-gray with threads of of gold-tan. So pretty, and perfect with the other colors in our house. It also works really nicely with the rug. For those interested in the details, it's model number 3970-23RF Cornering Sofa and 3970-19LF One Arm Love Seat in fabric Bart Sea. It's almost the same size on both sides - about 88" so it fits nicely in our room without dominating the space. We can also move it to the other side of the room if we choose to, but I like the view towards the back of the house more than the view towards the front! Of course, this purchase invites all sorts of other purchases like a new coffee table, throw pillows, and a new accent chair... but all in good time.